« Is your marriage like your grandparents’? ..lately, ‘homemaker’ is having a re-birth, both as a word and a lifestyle. I keep coming across women (and a very small handful of men) who describe themselves as ‘hipster homemakers’ or ‘radical homemakers’ or ‘new homemakers.’ They seem to be interested in claiming social and environmental value for the task of caring for one’s home, enlarging the concept of “homemaker” to mean more than just “chief vacuumer.” …Other people I’ve talked to see claiming the label of ‘homemaker’ as a ‘screw you’ to a world that only values career and financial success. Some of these people do have outside jobs, but choose to identify themselves by their relationship to their home rather than their career. Others simply see the word as having been de-valued as women entered the workforce in large numbers in the 20th century, and are pushing to reclaim it in a positive way. After all, it is (theoretically) a gender-neutral word, which – unlike housewife – doesn’t define the person by their relationship to a spouse. Now, over in Slate, Jessica Grose bemoans the rise of the term “stay-at-home mom,” which is apparently quite new – the New York Times didn’t even use the phrase until 1992. Grose, who dislikes “stay-at-home mom” because “[i]t connotes “shut in” to me, as if mothers who don’t do paid work are too fragile to handle the outside world,” suggests “primary caretaker” as an alternative, though admits that sounds a bit formal and odd. Thoughts? For those of you who stay at home with kids, what term do you prefer? 2 comments to Homemaker? Housewife? Stay-at-home parent? 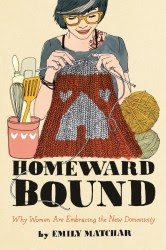 I’ve found myself many times using the word “homemaker” as a portmanteau of “home made” and “maker” (someone who makes things, whether from string or diodes): a maker who makes things at home not at a makerspace. I keep being frustrated that that’s not what it means when I Google! It seems like it should be the word for anyone who sells on Etsy.